If you’re thinking about having central air conditioning installation done in your home but you aren’t sure how much it’s going to cost, there are a lot of considerations to be made. You can’t just go to the local cooling and heating store and price out cooling units, because the unit itself is only a small part of the total overall cost. Instead, you have to learn about all the costs involved, and then use that knowledge to help you make the best choices for your needs. When a central air unit is put in your home, there is a lot of sizing and measuring that has to be done to locate the proper unit, as well as a great deal of labor necessary to get it running properly, especially when it’s the first central air unit. To determine the proper unit for your home, two factors have to be taken into consideration. First is the size of the system installed, and second is the SEER, or seasonal energy efficiency rating of the system. Each of these things is an important piece of the puzzle. An HVAC expert needs to take a look at the size and type of your home, as well as your climate conditions to determine what size central air unit you need. A smaller home will naturally require a smaller cooling unit than a large house does. The installer should determine the type of insulation you have in your home as well, and how efficient your house is overall, because if the cool air stays in better, you can get by with a smaller unit as well. The units range in size from 1 ton all the way up to 10 tons and more, but most standard homes are fine with between 1 and 5 ton units. A 1 ton unit removes 12,000 BTU’s (British Thermal Units) of heat from a home every hour. That’s about 288,000 BTU’s per day. That figure goes up evenly with every ton increase in the unit’s size. It’s important that you get a unit that’s just right for your home. A unit that is too small will be overworked and probably won’t cool your home to your satisfaction. A unit that’s oversized will cost you more than necessary because it won’t have enough time to cycle up into its most efficient operating conditions. That’s why it’s so important to find a professional who will take his time and really match a unit to your home properly. 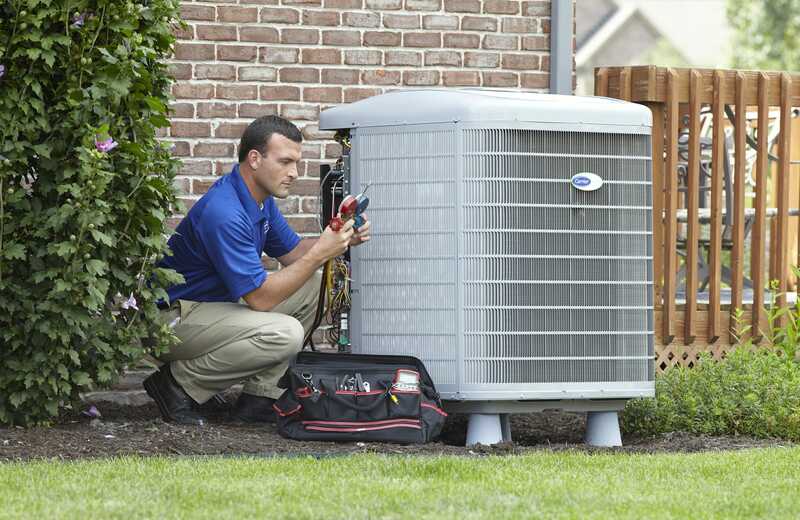 One of the main factors that controls the cost of a new central air unit is the SEER number. A Higher SEER means that the system costs less to run than a lower SEER, but it also means the unit is more expensive to purchase. Every unit sold today is at least 13 SEER, because that’s the federal minimum allowed. Units go all the way up to 27 SEER though, and those units are much more efficient than the 13 SEER models. It’s hard to give exact efficiency ratings of different SEER units, but direct comparisons can be made. For instance, a 14 SEER unit is about 5% more efficient than a 13 SEER option. As the SEER climbs higher, the difference between each level gets smaller. Going from a 17 SEER to an 18 SEER will only provide you with a 3% efficiency increase—that’s because as systems become more efficient, it becomes more and more difficult to improve them further. Buyers looking to cut down on their energy costs might be well-served by looking for a higher SEER unit, but it’s important to consider the cost difference between units as well. Before being up-sold to for thousands of dollars, it’s important to consider how much money will actually be saved every month, and whether those savings will add up in time for you to actually enjoy them before getting a new system or moving out. The highest efficiency coolers can cost upwards of $10,000, while it’s not uncommon to see 13 SEER unit at around $2,000 or even less. That’s a pretty major difference that has to be considered. The amount you pay for labor really depends on your home conditions. If you already have a unit installed and just want it replaced, you’re going to pay considerably less than if you were having one put in for the first time. When you have a new installation performed, you’re paying for electrical work, ductwork, and mounting expenses, as well as the actual cost to size your home and bring in the proper unit for the installation. New breakers and wiring need to be installed for the unit. The cooling equipment has to be tied into existing ducts. Brackets or mounting bolts have to be put into your foundation or another point on your property, and not to mention that the new equipment has to be brought into your home. What seems like a simple installation is actually quite labor intensive, and that’s why it’s common to pay from $2,000 on the low end, to more than $7,000 on the higher end just for labor, depending on what you need. Even when replacing an old AC unit, most qualified professionals will size your home to make sure they’re getting the right size for you. They will also check the integrity of ductwork and wiring and make any necessary changes and improvements. Simply taking out the old unit and putting a new one in isn’t difficult, but you’re still looking at a few thousand in labor costs to have the work done. It’s vital that you don’t cheap out on labor costs, because a properly installed unit is going to perform much better than an improperly installed one, even if it’s a SEER unit. Spending more on labor is the way to go, even if you have to opt for a more cost-effective cooling unit to compensate. Get quotes from different providers and make sure you know what’s included with each of those quotes to see what you’re really getting. It’s impossible to say what your costs specifically will be to have a central air unit put in. The national average is between $4,500 and $6,200 for unit installations, but it’s important to realize that there are probably more replacements occurring than new installations. If you’re having a unit put in for the first time, if you live in a larger-than-average home, or if you live in a warmer-than-average climate, you shouldn’t be surprised if that figure climbs well above the top end of the range. Since pricing is so variable between homes, it’s important to get several quotes before deciding who to work with.